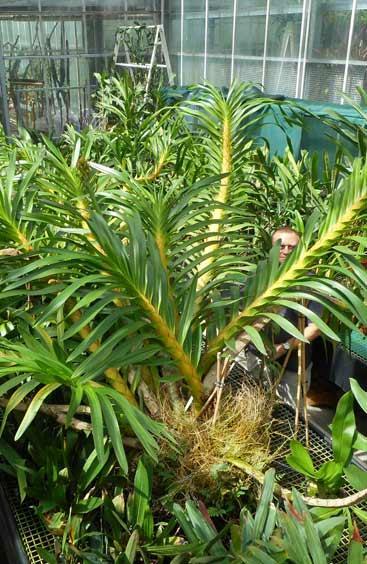 Queen of orchids is reputed to be the largest of all orchids with its immense leafy stems, each several metres long in a mature specimen. A plant weighing two tonnes was one of the highlights of the 1851 Great Exhibition in Hyde Park in London. The generic name Grammatophyllum comes from the Greek for letter (gramma) and leaf (phyllon) in reference to the dark and conspicuous markings on the sepals and petals, perhaps thought to resemble writing. The specific epithet speciosum comes from the Latin for showy, in relation to the striking flowers of this species. This species is known as sugar cane orchid in many areas where it is native, as a result of the perceived resemblance of its foliage to that of sugar cane (Saccharum officinarum). 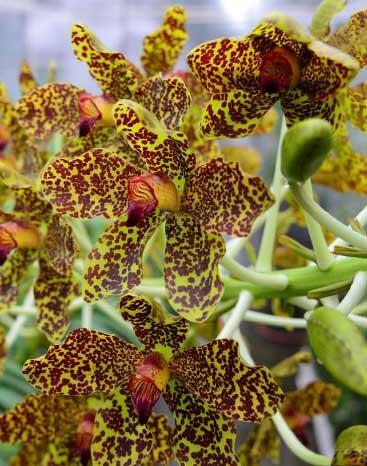 Queen of orchids is native to Laos, Myanmar, Thailand, Vietnam, Borneo, Indonesia (Sumatra, Java, Sulawesi) and Malaysia. It has also been recorded in the Philippines, New Guinea and the Solomon Islands. Overview: A large epiphytic (rarely terrestrial) herb, often growing in the first fork of a tall tree. Can form a large clump. Pseudobulbs dull yellow, clustered, stem-like, many-noded, leafy in the apical part. Leaves: Linear, arranged in two rows, 50-100 cm by 3 cm, drooping from the base when older. Flowers: Large (up to 10 cm in diameter), almost flat, sepals and petals pale or greenish yellow, heavily spotted with chestnut markings. 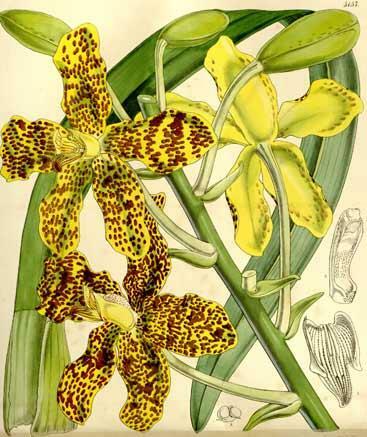 Labellum (lip) yellow, three-lobed, with red-brown veins on side lobes and red-brown marks on mid lobe, disc ornamented by three short ridges. Flowers are borne on a densely flowered inflorescence up to 2 m or more long. Inflorescences bearing some sterile flowers near the base. These lack both lip and column, and are fragrant, attracting pollinators. Flowers are visited by large Xylocopa bees. Once a plant has reached maturity it flowers every two to four years, with flowers lasting for up to two months. In cultivation in temperate regions it flowers less frequently. It has been observed that dry weather can trigger mass flowering. 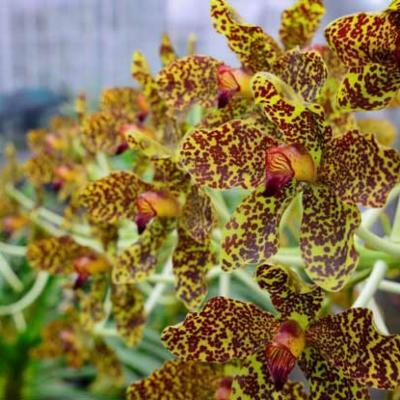 Queen of orchids is cultivated as an ornamental by orchid enthusiasts, although a large space within a glasshouse is needed to do so in temperate regions. In Indonesia the flowers have been used as hair adornments. 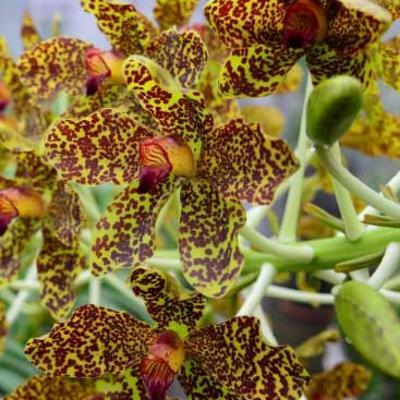 Queen of orchids is relatively rare in cultivation due to its enormous size. A suitably large container (such as a slatted wooden basket) is needed, and the plant should not be disturbed too often. It should be kept at a minimum of 15 °C, provided with good light and watered heavily throughout the year, with a slight reduction in watering during winter when the temperature should be reduced to 18 °C. Fertiliser should be applied regularly throughout the year, with a higher nitrogen content in summer, and with reduced nitrogen but increased potassium content during late autumn to early spring. 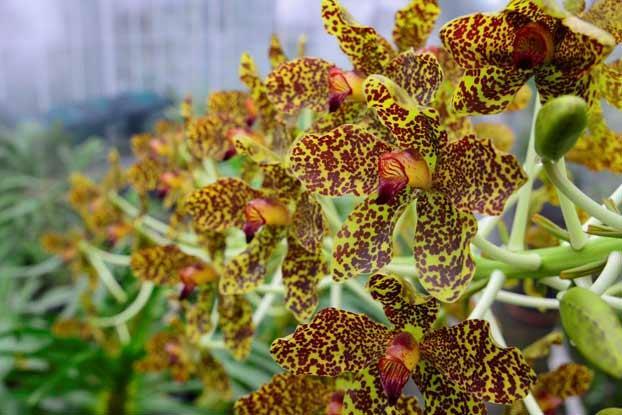 Queen of orchids is grown in Kew's behind-the-scenes Tropical Nursery. 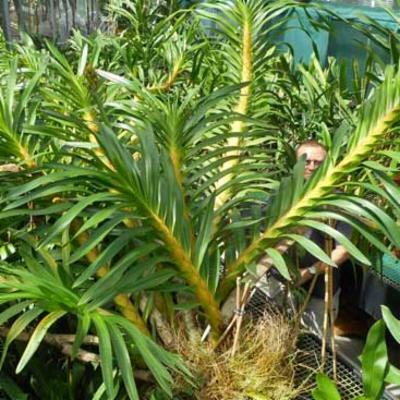 This plant, which was collected by Phillip Cribb and Christopher Bailes in Sabah in 1983, produced a flowering spike for the first time in August 2015. Dried and alcohol-preserved specimens of Grammatophyllum speciosum are held in Kew's Herbarium. 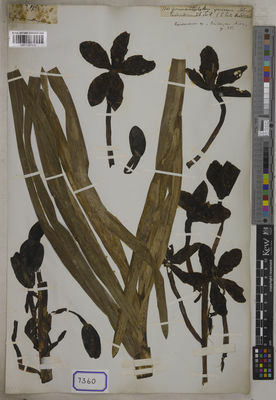 Details of some of these specimens are available online in Kew's Herbarium Catalogue. Listed in Appendix II of CITES (Convention on International Trade in Endangered Species of Wild Fauna and Flora). Grammatophyllum giganteum Blume ex Rchb.f. Averyanov, L.V. & al. (2016). New species of Orchids (Orchidaceae) in the Flora of Vietnam Taiwania 61: 319-354. Pedersen, H.Æ. & al. (2014). Flora of Thailand 12(2): 303-670. The Forest Herbarium, National Park, Wildlife and Plant Conservation Department, Bangkok. Yukawa, T., Kinoshita, A. & Tanaka, N. (2013). 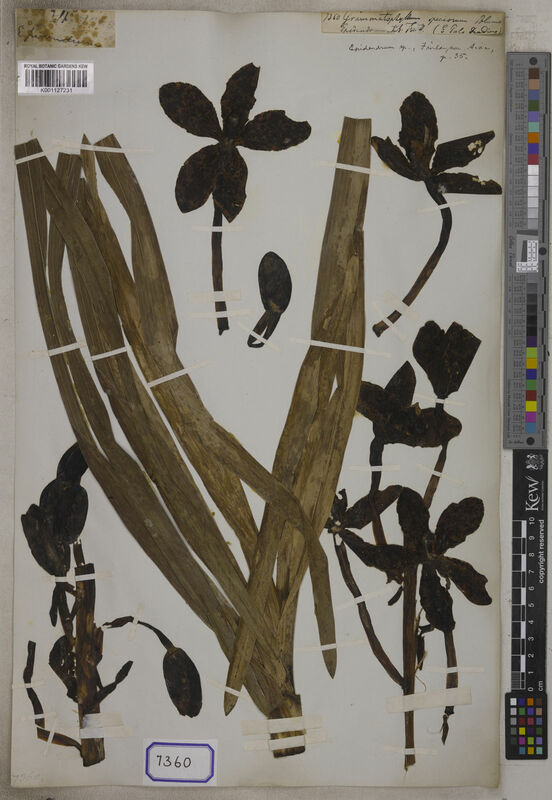 Molecular identification resolves taxonomic confusion in Grammatophyllum speciosum complex (Orchidaceae) Bulletin of the National Museum of Natature and Science, Tokyo, Series B (Botany) 39: 137-145. Sittisujjatham, S. (2009). Wild Orchid of Thailand 2: 1-463. Amarin. Tiu, D.A. (2009). Deciphering the Scriptures on Philippine Grammatophyllum: 1-93. PCARRD-DOST, Los Baños, Philippines. Orchids Wiki (2015). 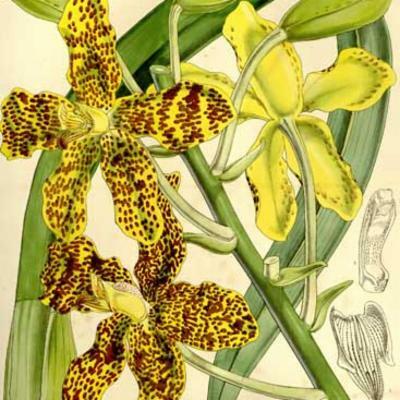 Grammatophyllum speciosum. WCSP (2015). World Checklist of Selected Plant Families. Facilitated by the Royal Botanic Gardens, Kew. Pederson, H. AE. et al. (2014). Flora of Thailand Volume 12: Orchidaceae 2. The Forest Herbarium, Bangkok, Thailand. Pridgeon, A. M., Cribb, P. J., Chase, M. W. & Rasmussen, F. N. (2009). Genera Orchidacearum, Volume 5: Epidendroideae Part Two. Oxford University Press, Oxford. Stearn, W. T. (2002). Stearn’s Dictionary of Plant Names for Gardeners. Cassell, London. Wood, J. J., Beaman, R. S. & Beaman, J. H. (1993). The Plants of Mount Kinabalu 2: Orchids. RBG Kew, Surrey, UK.